There are many ways to prepare and cook a turkey for the holidays from roasting whole to cutting into quarters and cooking separate. In the end, most methods work well enough. But “well enough” is not good enough for us. In our journey to find the best way to prepare a turkey we have tried it all. We always come back to the method that produces great results every time – spatchcock the turkey and smoke it. Spatchcocking is a simple technique that includes cutting out the backbone of the turkey, removing the ribs, and laying the bird out flat so that the dark and white meat all cook in the same period of time. No more overcooked breast just to have dark meat that is finished to perfection. This method will allow you to finish all of the bird at the same time. Step 1: Pull the giblets and the turkey neck from the inside of the bird. 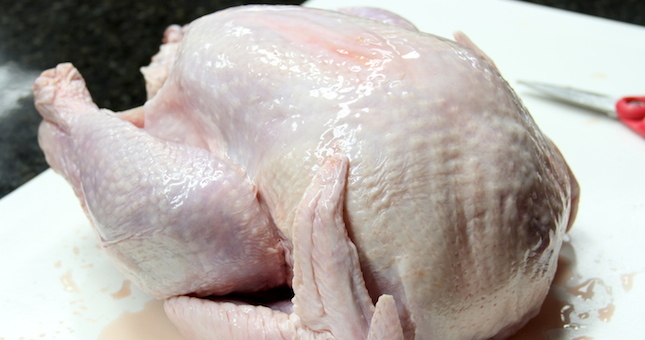 Rinse the turkey under cold water and pat it dry (both on top of and under the skin) with paper towels. This will make the turkey easier to grip and keep it from sliding as you cut out the backbone. 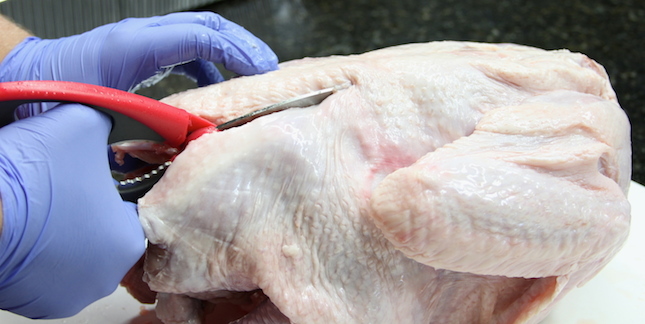 Step 2: Using good poultry shears, start at the back of the turkey and work your way up one side of the backbone. Cut until you reach the neck. Take the time now to try and remove all of the rib bones from the turkey. This will ensure easier carving and make serving much easier once the bird is cooked. Repeat this for the left side, again making sure you remove rib bones and other loose bones as you go. Step 3: Turn the turkey over and press down on the breast. This may take some muscle, but it is an extremely important step as this will allow the bird to lay flat, giving you a more even area to prepare and cook.